This article is about the Jewish educational system. For the private university, see Yeshiva University. For the Yeshiva site, see Yeshiva.co. Yeshiva (/jəˈʃiːvɑː/; Hebrew: ישיבה‎, lit. "sitting"; pl. ישיבות‎, yeshivot or yeshivos) is a Jewish institution that focuses on the study of traditional religious texts, primarily the Talmud and Torah study. Study is usually done through daily shiurim (lectures or classes) and in study pairs called ḥavrutas (Aramaic for "friendship" or "companionship"). 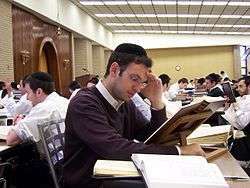 Ḥavruta-style learning is one of the unique features of the yeshiva. In the United States and Israel, the different levels of yeshiva education have different names. In the United States, elementary-school students are enrolled in a yeshiva, post-bar mitzvah-age students learn in a metivta, and undergraduate-level students learn in a beit midrash or yeshiva gedola (Hebrew: ישיבה גדולה‎‎, lit. "large yeshiva" or "great yeshiva"). In Israel, elementary-school students are enrolled in a Talmud Torah or cheder, post-bar mitzvah-age students learn in a yeshiva ketana (Hebrew: ישיבה קטנה‎‎, lit. "small yeshiva" or "minor yeshiva"), and high-school-age students learn in a yeshiva gedola. A kollel is a yeshiva for married men. It is common for a kollel to pay a token stipend to its students. Students of Lithuanian and Hasidic yeshiva gedolas usually learn in yeshiva until they get married. Historically, yeshivas were attended by males only. Today, all non-Orthodox and a few Modern Orthodox yeshivas are open to females. Although there are separate schools for Orthodox women and girls, yeshivas for women do not follow the same structure or curriculum as the traditional yeshiva for boys and men. 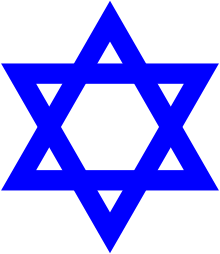 Alternate spellings and names include yeshivah (/jəˈʃiːvɑː/; Hebrew: ישיבה‎‎, "sitting" (noun); metivta and mesivta (Aramaic: מתיבתא‎‎ methivta); Beth midrash, Talmudical Academy, Rabbinical Academy; and Rabbinical School. The word yeshiva, lit. "sitting", is applied to the activity of learning in class, and hence to a learning "session." The transference in meaning of the term from the learning session to the institution itself appears to have occurred by the time of the great Talmudic Academies in Babylonia, Sura and Pumbedita, which were known as shte ha-yeshivot, "the two colleges." The Mishnah tractate Megillah mentions the law that a town can only be called a "city" if it supports ten men (batlanim) to make up the required quorum for communal prayers. Likewise, every beth din ("house of judgement") was attended by a number of pupils up to three times the size of the court (Mishnah, tractate Sanhedrin). These might be indications of the historicity of the classical yeshiva. As indicated by the Talmud, adults generally took off two months a year, Elul and Adar, the months preceding the pilgrimage festivals of Sukkot and Pesach, called Yarḥei Kalla (Aramaic for "Months of Kallah") to study. The rest of the year they worked. The Geonic period takes its name from Gaon, the title bestowed on the heads of the three yeshivas in existence from the third to the thirteenth century. The Geonim acted as the principals of their individual yeshivot, and as spiritual leaders and high judges for the wider communities tied to them. The yeshiva conducted all official business in the name of its Gaon, and all correspondence to or from the yeshiva was addressed directly to the Gaon. Throughout the Geonic Period there were three yeshivot. These were named for the cities in which they were located: Jerusalem, Sura, and Pumbedita; the yeshiva of Jerusalem would later relocate to Cairo, and the yeshivot of Sura and Pumbedita to Baghdad, but retain their original names. Each Jewish community would associate itself with one of the three yeshivot; Jews living around the Mediterranean typically followed the yeshiva in Jerusalem, while those living in the Arabian Peninsula and modern-day Iraq and Iran typically followed one of the two yeshivot in Baghdad. There was however, no requirement for this, and each community could choose to associate with any of the yeshivot. The yeshiva served as the highest educational institution for the Rabbis of this period. In addition to this, the yeshiva wielded immense power as the principal body for interpreting Jewish law. In this regard, the community saw the Gaon of a yeshiva as the highest judge on all matters of Jewish law. Each yeshiva ruled differently on matters of ritual and law; the other yeshivot accepted these divisions, and all three ranked as equally orthodox. The yeshiva also served as an administrative authority, in conjunction with local communities, by appointing members to serve as the head of local congregations. Those appointed as the head of a congregation would serve as a go-between for the local congregation and the larger yeshiva it was attached to. These local leaders would also submit questions to the yeshiva to obtain final rulings on issues of dogma, ritual, or law. Each congregation was expected to follow only one yeshiva to prevent conflict with different rulings issued by different yeshivot. The yeshivot were financially supported through a number of means. There were fixed, but voluntary, yearly contributions made to the yeshivas; these annual contributions were collected and handled by the local leaders appointed by the yeshiva. Private gifts and donations from individuals were also common, especially during holidays, and could consist of money or goods. The yeshiva of Jerusalem was finally forced into exile in Cairo in 1127, and eventually dispersed entirely. Likewise, the yeshivot of Sura and Pumbedita were dispersed following the Mongol invasions of the 13th century. After the scattering of the yeshiva, education in Jewish religious studies became the responsibility of individual synagogues. No organization ever came to replace the three great yeshivot of Jerusalem, Sura and Pumbedita. After the Geonic Period Jews went on to establishing more Yeshiva academies in Europe and in Northern Africa. One of these include the Kairuan yeshiva in Spain (Hebrew: ישיבת קאירואן) that was established by Chushiel Ben Elchanan (Hebrew: חושיאל בן אלחנן) in 974. Traditionally, every town rabbi had the right to maintain a number of full-time or part-time pupils in the town's beth midrash (study hall, usually adjacent to the synagogue). Their cost of living was covered by community taxation. After a number of years, these young people would either take up a vacant rabbinical position elsewhere (after obtaining semicha, rabbinical ordination) or join the workforce. Organised Torah study was revolutionised by Rabbi Chaim Volozhin, a disciple of the Vilna Gaon (an influential 18th-century leader of Judaism). In his view, the traditional arrangement did not cater for those who were looking for more intensive study. With the support of his teacher, Rabbi Volozhin gathered a large number of interested students and started a yeshiva in the (now Belarusian) town of Volozhin. Although the Volozhin yeshiva was closed some 60 years later due to the Russian government's demands for the introduction of certain secular studies, a number of yeshivot opened in other towns and cities, most notably Slabodka, Panevėžys, Mir, Brisk, and Telz. Many prominent contemporary yeshivot in the United States and Israel are continuations of these institutions and often bear the same name. In the 19th century, Rabbi Israel Salanter initiated the Mussar movement in non-Hasidic Lithuanian Jewry, which sought to encourage yeshiva students and the wider community to spend regular times devoted to the study of Jewish ethical works. Concerned by the new social and religious changes of the Haskalah (secularising movement), and emerging political ideologies such as Zionism, that often opposed traditional Judaism, the masters of Mussar saw a need to augment Talmudic study with more personal works. These comprised earlier classic Jewish ethical texts (mussar literature), as well as a new literature for the movement. By focusing the student on self-understanding and introspection, often with profound psychological insight, the spiritual aims of Judaism could be internalized. After early opposition, the Lithuanian yeshivah world saw the need for this new component in their curriculum, and set aside times for individual mussar study and mussar talks ("mussar shmues"). A spiritual mentor (mashgiach ruchani) encouraged the personal development of each student. To some degree also, this Lithuanian movement arose in response, and as an alternative, to the separate mystical study of the Hasidic Judaism world. Hasidism began previously, in the 18th Century, within traditional Jewish life in the Ukraine, and spread to Hungary, Poland and Russia. As the 19th Century brought upheavals and threats to traditional Judaism, the Mussar teachers saw the benefit of the new spiritual focus in Hasidism, and developed their alternative ethical approach to spirituality. Some variety developed within Lithuanian yeshivas to methods of studying Talmud and mussar, for example the contrast between breadth (beki'ut) and depth (iyyun), or the place given to pilpul (the type of casuistic argumentation popular from the 16th to 18th centuries). The new analytical approach of the Brisker method, developed by Rabbi Chaim Soloveitchik of Brisk, has become widely popular, though there are other approaches such as those of Mir, Chofetz Chaim, and Telz. In mussar different schools developed, such as Slabodka and Novhardok, though today a decline in devoted spiritual self-development from its earlier intensity has to some extent levelled out the differences. With the success of the yeshiva institution in Lithuanian Jewry, the Hasidic world developed their own yeshivas, in their areas of Eastern Europe. These comprised the traditional Jewish focus on Talmudic literature that is central to Rabbinic Judaism, augmented by study of Hasidic philosophy (Hasidism). Examples of these Hasidic yeshivas are the Chabad Lubavitch yeshiva system of Tomchei Temimim, founded by Sholom Dovber Schneersohn in Russia in 1897, and the Chachmei Lublin Yeshiva established in Poland in 1930 by Meir Shapiro, who is renowned in both Hasidic and Lithuanian Jewish circles for initiating the Daf Yomi daily cycle of Talmud study. In many Hasidic yeshivas, study of Hasidic texts is a secondary activity, similar to the additional mussar curriculum in Lithuanian yeshivas. These paths see Hasidism as a means to the end of inspiring emotional devekut (spiritual attachment to God) and mystical enthusiasm. In this context, the personal pilgrimage of a Hasid to his Rebbe is a central feature of spiritual life, in order to awaken spiritual fervour. Often, such paths will reserve the Shabbat in the yeshiva for the sweeter teachings of the classic texts of Hasidism. In contrast, Chabad and Breslov, in their different ways, place daily study of their dynasties' Hasidic texts in central focus. Illustrative of this is Sholom Dovber Schneersohn's wish in establishing the Chabad yeshiva system, that the students should spend a part of the daily curriculum learning Chabad Hasidic texts "with pilpul". Pilpul is the in-depth analytical investigation of a topic, traditionally reserved for the profound nuances of Talmudic study. The idea to learn Hasidic mystical texts with similar logical profundity, derives from the unique approach in the works of the Rebbes of Chabad, initiated by its founder Schneur Zalman of Liadi, to systematically investigate and articulate the "Torah of the Baal Shem Tov" in intellectual forms. Further illustrative of this is the differentiation in Chabad thought (such as the "Tract on Ecstasy" by Dovber Schneuri) between general Hasidism's emphasis on emotional enthusiasm and the Chabad ideal of intellectually reserved ecstasy. In the Breslov movement, in contrast, the daily study of works from the imaginative, creative radicalism of Rabbi Nachman of Breslov awakens the necessary soulfulness with which to approach other Jewish study and observance. Although the yeshiva as an institution is in some ways a continuation of the Talmudic Academies in Babylonia, large scale educational institutions of this kind were not characteristic of the North African and Middle Eastern Sephardi Jewish world in pre-modern times: education typically took place in a more informal setting in the synagogue or in the entourage of a famous rabbi. In medieval Spain and immediately following the expulsion in 1492 there were some schools which combined Jewish studies with sciences such as logic and astronomy, similar to the contemporary Islamic madrasas. In 19th-century Jerusalem a college was typically an endowment for supporting ten adult scholars rather than an educational institution in the modern sense; towards the end of the century a school for orphans was founded providing for some rabbinic studies. Early educational institutions on the European model were Midrash Bet Zilkha founded in 1870s Iraq and Porat Yosef Yeshiva founded in Jerusalem in 1914. Also notable is the Bet El yeshiva founded in 1737 in Jerusalem for advanced Kabbalistic studies. Later Sephardic yeshivot are usually on the model either of Porat Yosef or of the Ashkenazi institutions. The Sephardic world has traditionally placed the study of esoteric Jewish mysticism (Kabbalah) in a more mainstream position that in the European Ashkenazi world. This difference of emphasis arose in reaction to the historical events of the Sabbatean heresy in the 17th Century, that suppressed widespread study of Kabbalah in Europe in favour of the strength of Rabbinic Talmudic study. In Eastern European Lithuanian life, Kabbalah was reserved for an intellectual elite, while the mystical revival of Hasidism articulated Kabbalistic theology through Hasidic thought. These factors did not affect the Sephardi Jewish world, which retained a wider connection to Kabbalah in its traditionally observant communities. With the establishment of Sephardi yeshivas in Israel, after the immigration of the Arabic Jewish communities there, some Sephardi yeshivas incorporated study of more accessible Kabbalistic texts into their curriculum. Nonetheless, the European prescriptions to reserve advanced Kabbalistic study to mature and elite students also influence the choice of texts in such yeshivas. In 1854, the Jewish Theological Seminary of Breslau was founded. It was headed by Zecharias Frankel, and was eventually viewed as the first yeshiva associated with Conservative Judaism. In subsequent years, Conservative Judaism established a number of other institutions of higher learning (such as the Jewish Theological Seminary of America in New York City) that emulate the style of traditional yeshivas in significant ways. However, many do not officially refer to themselves as "yeshivas" (one exception is the Conservative Yeshiva in Jerusalem), and all are open to both women and men, who study in the same classrooms and follow the same curriculum. Students may study part-time, as in a kollel, or full-time, and they may study lishmah (for the sake of studying itself) or towards earning rabbinic ordination. Non-denominational yeshivas and kollels with connections to Conservative Judaism include Yeshivat Hadar in New York, the leaders of whom include Rabbinical Assembly members Elie Kaunfer and Shai Held. The rabbinical school of the Academy for Jewish Religion in California (AJR-CA) is led by Conservative rabbi Mel Gottlieb. The faculty of the Academy for Jewish Religion in New York and of the Rabbinical School of Hebrew College in Newton Centre, Massachusetts also includes a large number of Conservative rabbis. Hebrew Union College (HUC), affiliated with Reform Judaism, was founded in 1875 under the leadership of Rabbi Isaac Mayer Wise in Cincinnati, Ohio. HUC later opened additional locations in New York, Los Angeles, and Jerusalem. It is a rabbinical seminary or college mostly geared for the training of rabbis and clergy specifically. Similarly, the Reconstructionist Rabbinical College of Reconstructionist Judaism, founded in Pennsylvania in 1968, functions to train its future clergy. Some Reform and Reconstructionist teachers also teach at non-denominational seminaries like the Academy for Jewish Religion in New York, the Academy for Jewish Religion in California, and the Rabbinical School of Hebrew College. None of these institutions describes itself as a "yeshiva". Yeshiva ketana ("junior yeshiva") - Many yeshivot ketanot in Israel and some in the Diaspora do not have a secular course of studies and all students learn Judaic Torah studies full-time. Yeshiva High School - Also called Mesivta or Mechina or Yeshiva Ketana, combines the intensive Jewish religious education with a secular high school education. The dual curriculum was pioneered by the Manhattan Talmudical Academy of Yeshiva University (now known as Marsha Stern Talmudical Academy) in 1916. Mechina - For Israeli high-school graduates who wish to study for one year before entering the army. (Note in Telshe yeshivas they call their Mesivtas/Yeshiva ketanas, Mechinas. Beth Medrash - For high school graduates, and is attended from one year to many years, dependent on the career plans and affiliation of the student. Yeshivat Hesder - Yeshiva that has an arrangement with the Israel Defense Forces by which the students enlist together in the same unit and, as much as is possible serve in the same unit in the army. Over a period of about 5 years there will be a period of service starting in the second year of about 16 months. There are different variations. The rest of the time will be spent in compulsory study in the yeshiva. Kollel - Yeshiva for married men. The kollel idea, though having its intellectual roots traced to the Torah, is a relatively modern innovation of 19th-century Europe although The Mishnah tractate Megillah mentions the law that a town can only be called a "city" if it supports ten men (batlanim) to make up the required quorum for communal learning. Often, a kollel will be in the same location as the yeshiva. Baal teshuva yeshivot catering to the needs of the newly Orthodox. Traditionally, religious girls' schools are not called "yeshiva." The Beis Yaakov system was started in 1918 under the guidance of Sarah Schenirer. This system provided girls with a Torah education, using a curriculum that skewed more toward practical halakha and the study of Tanakh, rather than Talmud. Beis Yaakovs are strictly Haredi schools. Non-Haredi girls' schools' curricula often includes the study of Mishna and sometimes Talmud. They are also sometimes called "yeshiva" (e.g., Prospect Park Yeshiva). Post-high schools for women are generally called "seminary" or "midrasha". Learning at an Orthodox yeshiva includes Torah study; the study of Rabbinic literature, especially the Talmud (Rabbinic Judaism's central work); and the study of Responsa for Jewish observance, and alternatively ethical (Musar) or mystical (Hasidic philosophy) texts. In some institutions, classical Jewish philosophy texts or Kabbalah are studied, or the works of individual thinkers (such as Abraham Isaac Kook). Non-Orthodox institutions offer a synthesis of traditional and critical methods, allowing Jewish texts and tradition to encounter social change and modern scholarship. The curriculum focuses on classical Jewish subjects, including Talmud, Tanakh, Midrash, Halacha, and Philosophy, with an openness to modern scholarship. Yeshiva students prepare for and review the shiur with their chavruta during a study session known as a seder. In contrast to conventional classroom learning, in which a teacher lectures to the student and the student repeats the information back in tests, chavruta-style learning challenges the student to analyze and explain the material, point out the errors in his partner's reasoning, and question and sharpen each other's ideas, often arriving at entirely new insights of the meaning of the text. A chavruta helps a student keep his mind focused on the learning, sharpen his reasoning powers, develop his thoughts into words, organize his thoughts into logical arguments, and understand another person's viewpoint. Chavruta-style learning tends to be loud and animated, as the study partners read the Talmudic text and the commentaries aloud to each other and then analyze, question, debate, and even argue their points of view to arrive at an understanding of the text. In the heat of discussion, they may even wave their hands, pound the table, or shout at each other. Depending on the size of the yeshiva, dozens or even hundreds of pairs of chavrutas can be heard discussing and debating each other's viewpoints. One of the skills of chavruta-style learning is the ability to block out all other discussions in the study hall and focus on one's chavruta alone. In most yeshivot, the year is divided into three periods (terms) called zmanim. Elul zman starts from the beginning of the Hebrew month of Elul and extends until the end of Yom Kippur. This is the shortest (approx. six weeks), but most intense semester as it comes before the High Holidays of Rosh Hashanah and Yom Kippur. Winter zman starts after Sukkot and lasts until about two weeks before Passover, a duration of five months (six in a Jewish leap year). Summer semester starts after Passover and lasts until Rosh Chodesh Av or Tisha B'Av, a duration of about three months. 8:00 p.m. - Night seder - Review of lecture, or study of choice. This schedule is generally maintained Sunday through Thursday. On Thursday nights there may be an extra long night seder, known as mishmar sometimes lasting beyond 1:00 am, and in some yeshivot even until the following sunrise. On Fridays there is usually at least one seder in the morning, with unstructured learning schedules for the afternoon. Saturdays have a special Shabbat schedule which includes some sedarim but usually no shiur. In the typical Orthodox yeshiva, the main emphasis is on Talmud study and analysis. Generally, two parallel Talmud streams are covered during a zman (trimester). The first is study in-depth (iyyun), often confined to selected legally focused tractates, with an emphasis on analytical skills and close reference to the classical commentators; the second seeks to cover ground more speedily, to build general knowledge (beki'ut) of the Talmud. In the yeshiva system of talmudic study the first area to be mastered are eight mesechtohs (volumes that deal with a given subject which are divided into chapters that deal with sub-topics relating to the general subject) that deal with civil jurisprudence. These are the mesechtohs that are studied in undergraduate yeshivot. These eight volumes are mastered first because it is with these subjects that a student can best master the technique of proper analysis of the talmud. Only after this technique is mastered is a student ready to go on to other areas of the talmud and develop a scholarship in all areas of the Talmud. Works generally studied to clarify the Talmudic text are the commentary by Rashi and the analyses of the Tosafists and other rishonim (commentators from the 11th to 14th centuries). There are two schools of rishonim, one from France and the other from Spain who will sometimes hold different interpretations and understandings of the Talmud. Various other mefarshim (commentators), from later generations are also used. Generally, a period is devoted to the study of practical halacha (Jewish law). The text most commonly studied in Ashkenazic Yeshivot is the Mishnah Berurah written by Rabbi Yisrael Meir Kagan, the Chofetz Chaim. The Mishnah Berurah is a compilation of halachic opinions rendered after the time of the writing of the Shulchan Aruch. In Sephardic Yeshivot, the Shulhan Arukh itself is more commonly studied. The Bet Yosef is also more widely studied in Sepharadic Yeshivot. Orchot Tzaddikim ("Paths [of the] Righteous") Its authorship and time of writing is uncertain, but as it quotes Maimonides, it was written some time after his works were disseminated. Chovot ha-Levavot, by Bahya ibn Paquda. 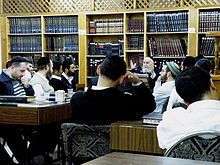 Mishnat R' Aharon Mussar Lectures on many topics by Rabbi Aharon Kotler. Mikhtav me-Eliyahu, the works of Rabbi Eliyahu Eliezer Dessler. Hasidic yeshivot study the mystical, spiritual works of Hasidic philosophy (Chassidus). This draws on the earlier esoteric theology of Kabbalah, but articulates it in terms of inner psychological awareness and personal analogies. This makes Jewish mysticism accessible and tangible, so that it inspires emotional dveikus (cleaving to God) and spiritual contribution to daily Jewish life. This serves some similar purposes to mussar, but through different means and with different contributions to intellectual and emotional life. Chabad yeshivot, for example, study the Tanya, the Likutei Torah, and the voluminous works of the Rebbes of Chabad for an hour and a half each morning, before prayers, and an hour and a half in the evening. Many Yeshivot in Israel belonging to the Religious Zionism study the writings of Rav Kook, who articulated a unique personal blend of mysticism, creative exegesis and philosophy. Intensive study of the Torah (Genesis, Exodus, Leviticus, Numbers and Deuteronomy with the commentary of Rashi (Rabbi Shlomo Yitzhaqi 1040 - 1105) is stressed and taught in all elementary grades, often with Yiddish translations and more notes in Haredi yeshivas. The teaching of Tanakh, Hebrew Bible, is usually only done on the high school level, and students read the Weekly Torah portion by themselves (known as the obligation of Shnayim mikra ve-echad targum, "Hebrew Bible twice and Aramaic Targum once"). Exceptions are the five Megilloth and Tehillim. Since their inception, Modern Orthodox yeshivot in Israel, offer courses in many, if not most, of the books of Nevi'im and Ketuvim. Some Yeshivas permit students to attend college on a limited basis, and this is facilitated by arrangements for the above study to receive credit towards a degree. In most Lithuanian and Hasidic yeshivot throughout the world, classes are taught in Yiddish; Modern Orthodox, Zionist or baal teshuvah yeshivot may use Israeli Hebrew or the local language. Students learn with each other in whatever language they are most proficient in, with Hasidic students usually learning in Yiddish, Israeli Lithuanian students in Hebrew, and American Lithuanian students in English. Yeshivish, also "Frumspeak", is a term used somewhat jokingly for the Yiddish- and Hebrew- influenced English used in Orthodox yeshivas in America. Reservoirs of Faith: The Yeshiva through the Ages, Zev T. Paretzky, Feldheim Publishers, 1996. 1 2 Liebersohn, Aharon (2006). World Wide Agora. p. 155. ISBN 978-965-90756-1-4. 1 2 3 Forta, Arye (1989). Judaism. Heineman Educational. p. 89. ISBN 0-435-30321-X. ↑ Berezovsky, Rabbi Sholom Noach (2001). Nesivos Sholom. p. 211. ISBN 1-58330-495-9. ↑ Kramer, Doniel Zvi (1984). The Day Schools and Torah Umesorah: The seeding of traditional Judaism in America. Yeshiva University Press. p. xiv. ↑ "Session", in fact, similarly derives from the Latin sedere, "to sit." ↑ S. D. Goitein, Ed. Jacob Lassner, A Mediterranean Society: An Abridgement in One Volume, (Berkeley: University of California Press, 1999). ↑ Elazar, Daniel J. "Can Sephardic Judaism Be Reconstructed?". Jerusalem Center for Public Affairs. Retrieved 13 July 2011. ↑ "Bringing the People Together". Reb Jeff. 24 February 2011. Retrieved 23 June 2011. ↑ Zobin, Zvi (1996). Breakthrough to Learning Gemora: A concise, analytical guide. Kest-Lebovits. pp. 104–106. ↑ Neusner, Jacob; Avery-Peck, Alan J. (2001). The Blackwell Reader in Judaism. Blackwell Publishers. p. 422. ISBN 0-631-20738-4. ↑ Finkel, Avraham Yaakov (1999). Ein Yaakov: The ethical and inspirational teachings of the Talmud. Jason Aronson. p. xxix. ISBN 0-7657-6082-7. ↑ "Guide To Degree Completion Programs for Yeshiva Students". YeshivaDegree.com. 2011. Retrieved 13 September 2011. ↑ Philogos (4 March 2011). "How to Understand Yeshivish". The Jewish Daily Forward. Retrieved 13 July 2011.